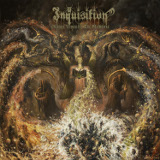 While always high-quality, I felt that Inquisition's style had really flowered with their previous album, Ominous Doctrines of the Perpetual Mystical Macrocosm, and a lot of their fans had been rather hoping for them to continue in that direction. Not only was it more abstract and cosmic in sound, it also was so in terms of lyrics, and it was going to be hard to top, but it looks to me that they've succeeded. Their latest LP, Obscure Verses for the Multiverse, changes very little from ODotPMM -- it's an incremental improvement -- but an improvement it is. In many ways, Inquisition reminds me of Immortal. Not because they sound very similar to each other (they don't), but because despite playing traditional black metal, they have an instantly recognizable sound, both in the vocals and the guitar, that's all their own. To the relentless background of Incubus's semi-muted drumming, Dagon's layered guitars go from sickeningly slow, ringing discordantly or bending up or down at the end of a riff, to high-speed chords that are both crushingly heavy and intricate, stopping occasionally for quieter, ominous interludes, sometimes sullenly growling, as in Spiritual Plasma Evocation, other times igniting into a blast of furiously tremolo-picked chords broken up by echoing arpeggios. Darkness Flows Towards Unseen Horizons and the title track even have soloes on them. The vocals are, as in previous albums, what one would get if a toad was recruited as the singer; definitely an acquired taste, though Dagon switches it up occasionally for effect with a whispered or roared pronouncement, and the lyrics, though still with a definite Satanic focus, continue Inquisition's trend toward more poetic descriptions of the dark universe their songs inhabit. Despite the fact that the band's formula is pretty straightforward, it's capable of a lot of variation (again I'm reminded of Immortal), and the more one listens, the more differentiated the songs become and the more appreciative one becomes of what they've created. Joined by Dark Matter Repelled by Dark Energy seemed with the first few chords to follow the same bending/ringing pattern Dagon likes to use throughout this album, and certainly there are plenty of repeated riffs that the tracks share, but rather than seeming like they're repeating themselves, it's more like these riffs are just a foundation for the song that then gets built into a unique creation; the parts that make it unique are the extra touches, such as the echoing palm-muting found there and the quiet bent/distorted breaks that come from Dagon's guitar, but sound almost like they ought to be sound effects. One of my favorites, Inversion of Ethereal White Stars, not only has the palm-muting emphasizing and sometimes replacing the usual riffs, but also a high, thin tremolo-picked line trembling above the verses, and for a few minutes, a melody in a major key. The final track, Infinite Interstellar Genocide, a fierce assault that doesn't let up or give much in the way of a break throughout the track, ends abruptly after four minutes with dim, distorted chanting and a raucous set of horns, perhaps the horns previously mentioned in ODotPMM's final track, Across the Abyss Ancient Horns Bray. On my copy there's a bonus track, as well -- Where Darkness Is Lord and Death Is the Beginning, from their 2007 album. Fans with their previous albums have heard it before, but in that choice, back to back with their newest material, one gets to see how the band has changed over the past six years: not in an abrupt transformation, but by slow increments that led us to this album. While I was impressed by ODotPMM, Obscure Verses for the Multiverse has done it one better and continues the uncompromising quality for which we've been commending Inquisition in the past.